Solar Cooking When is the Best Time? Whether you are Solar Cooking in the summer or winter...in the desert, backyard or at the beach; At certain times of the year solar cooking can be a little challenging. But it is possible to cook year around in many places throughout the United States, and elsewhere in the world, but it is done so with the understanding that there are some limitations during the fall,winter and early spring seasons when the sun is lower on the horizon and the intensity of the UV rays are not quite as great. There are places where it is not always easy to cook using the energy of the sun due to the general climate; places where there is above average cloudiness, rainfall and fog as found in some coastal areas in the States and elsewhere. I do know of some people, living in places such as Oregon, Washington, Minnesota and even London England, which use solar cookers and have had very great results when they are able to solar cook, though they do admit that they cannot do it as often as someone who lives in Southern Arizona or Texas. Other than certain more weather challenged locations, the principal determining factor will be the time of day that is best for effective cooking. The prime hours (ideal window) for cooking are to be found between 11:00 am to 3:00 pm; due to the position of the sun more directly overhead during the day thus radiating higher UV rays through the earth's atmosphere. You should plan your cooking efforts around these hours when possible. In the summertime you will have the added benefit of some bonus time, when the sun's trajectory is higher and more direct, where you can take advantage of at least a couple of hours more before and after the ideal window, especially if you live any where south of the northern hemisphere's 40th parallel (Salt Lake City, Washington D.C., Madrid, Istanbul, Peking) or north of the southern hemisphere's 40th parallel. (Melbourne, Cape Town) Beyond these parallels the intensity of the sun's rays diminishes more and more. Cooking temperatures are usually highest at peak hours of sunshine and should therefore be utilized for baking items such as your breads, cakes, and other baked goods. Slow cook items such as stews, chili, and soups etc. can simmer and boil at lower temperatures all through out your window of cook time. Though I live in an area (St. George, Utah) that is considered exceptional for solar cooking, due to the amount of sunny days, I do still have my challenges when we enter into the late fall, winter and early spring seasons with shorter, less intense hours of sunshine. In these shorter seasons my ideal cook time falls within the aforementioned window. But sometimes depending on the food I am going to cook, I will start as early as 10:00 am pre- heating the solar ovens and browning some ingredients, and go to 4:00 pm where I will maintain what has already cooked; in the warming stage. 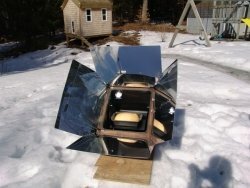 Tracking the sun with your solar cooker will become more of a factor during the short days (winter) of the year. You will need to move, or point, your solar cooker a bit more frequently towards the sun to maintain maximum cooking effectiveness. And in the summer you can leave your solar oven unattended for longer periods of time, diminishing the need to move it as often. In the shorter seasons of fall through spring,If you start a meal or dish and it looks like you may not have sufficient time remaining to finish cooking the food, you can do as I do and put it into the refrigerator and finish cooking the next day,using it for that day's meal. There are several dishes that I will often prepare, in steps, over a day or two so as not to compete against the clock and the sun. I cook in the spring and summer a lot, but do almost as much solar cooking in the winter and fall as well. As long as their is sunshine I can do so quite effectively. This information is offered as general advice on how and when to solar cook, you may find varying results and outcomes depending upon your specific locations and conditions. Besides the obvious benefits, to mankind and the environment, of living in a sustainable manner, there will come a time when alternative means of “doing and living” will help us to better confront and deal with periods of disaster, trouble, unrest and scarcity. 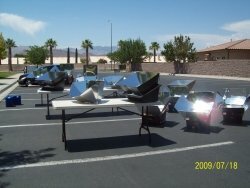 Got a Question about Solar Cooking? What would you most like to know? How might we answer your Solar Cooking Question? Submit your question and we will do our best to answer it for you. what solar cookers are better for the summer? how can we test our solar oven if the sun won't shine?